What is it about decks that fascinate most Americans? Whether homeowners live on the mainland, Hawaii, the tropical islands, and other parts of the world, the desire to have a deck almost always figures into the equation. 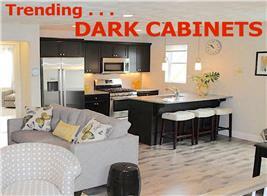 Just watch House Hunters on HGTV to get an idea of the popularity and great demand for decks. In fact, the U.S. Census Bureau’s annual study of the residential building industry showed that 671,000 of the 738,000 new single-family homes completed in 2016 had a deck, porch, or patio. And according to the North American Deck and Railing Association (NADRA), in 2016, about 2.5 million new or replacement decks were built in the U.S.
Geographical location is also a strong factor in the demand for decks. 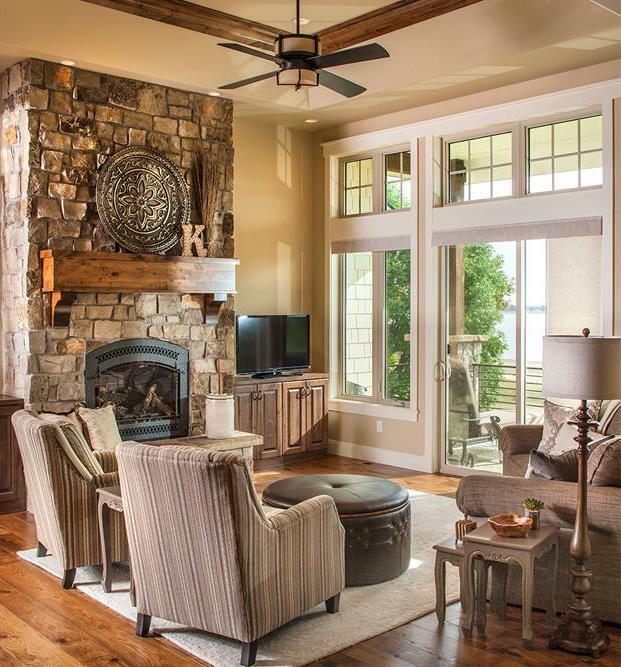 In 2016, New England and the East South Central region of the U.S. — Alabama, Kentucky, Mississippi, and Tennessee —showed some of the biggest upticks in single-family homes with decks. In New England, 63% of new single-family homes include decks; while in the East South Central states, 53% of new homes have decks. There is no reason to believe that the numbers will decrease any time soon as more Americans attempt to create outdoor living spaces that fit their lifestyles – and more importantly, their budgets. 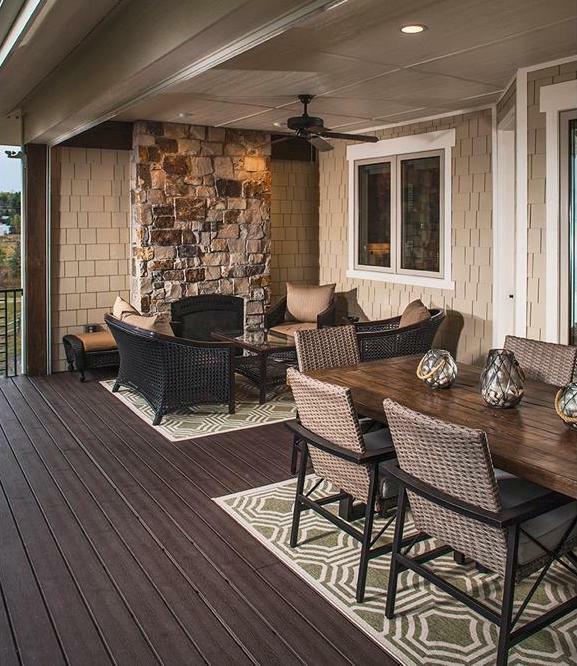 Can you see yourself relaxing and unwinding in this attractive and cozy sundeck with comfortable furnishings (courtesy of Deck and Basement Co.)? 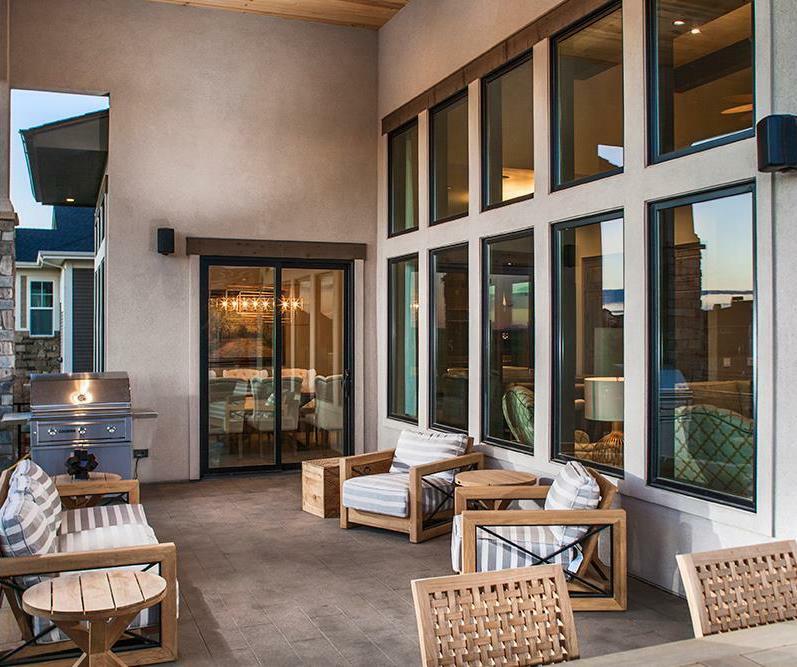 With the growing popularity of outdoor living spaces, the once simple and ordinary deck has become a trendy and stylish item of new single-family homes. While the front porch remains the signature feature of traditional homes, country homes, and farmhouse home plans – and a “must-have” for potential buyers – the deck is not far behind, with its own appeal and charm. Glass doors in this sitting room of a 1-story, 2,037-sq.-ft. Craftsman style home plan provide a seamless connection to its spacious covered deck (House Plan #161-1081). So why do homeowners love decks? 1. A well-planned deck extends the home’s space to the outdoors. It seamlessly connects a home’s interior to the backyard and the landscape. 2. 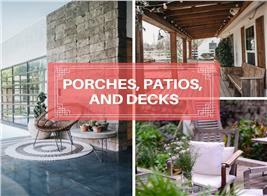 Decks are ideal entertaining spaces – perfect for cookouts, dinner parties, family gatherings, and social events. They are also great spots for relaxing, enjoying a morning coffee or an afternoon drink, and taking in the view. 3. They add visual appeal to the home – especially the backyard, which becomes more eye-catching with a creatively designed deck and fixtures. 4. Decks are more versatile than porches and provide privacy from street traffic. 5. They are easy to maintain. 6. Decks are relatively inexpensive and quick to build compared with other home additions. Because they can be completed in about a week’s time, they cause less disturbance to the household during construction. 7. 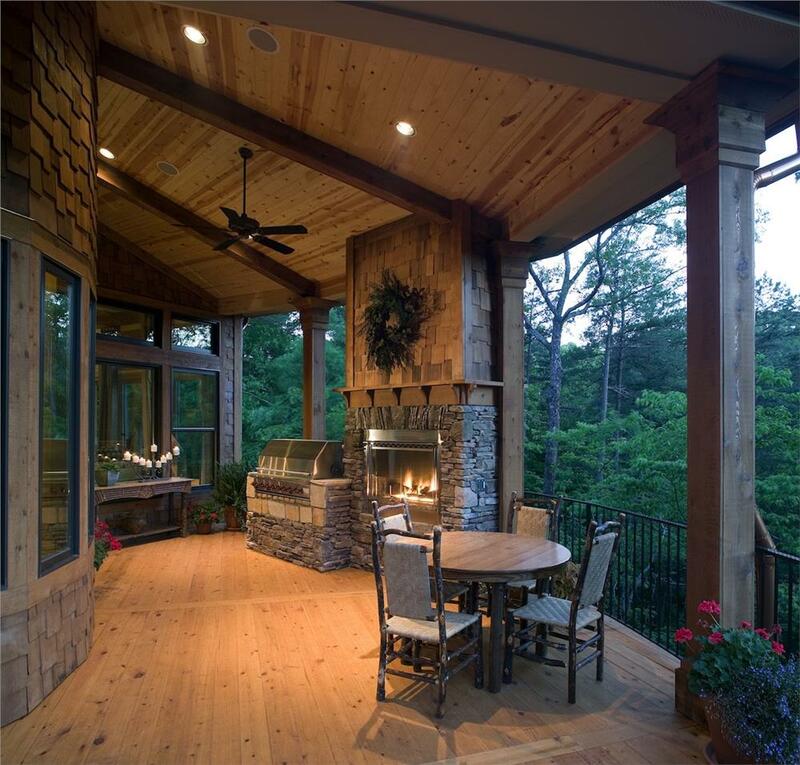 Decks increase the home’s value and marketability. The fireplace on this deck of a 2-story, 3-bedroom Arts and Crafts style home plan adds to the pleasure of enjoying the wonderful views (House Plan #198-1006). Is There a Deck in Your Dream Home’s Future? So you really want a deck. But before you jump into deck planning, there are a number of factors to carefully think about. Most impoartant is to take into account your home’s architectural design and its interior spaces when deciding on fixtures and accessories to make sure the deck fits your home and lifestyle. 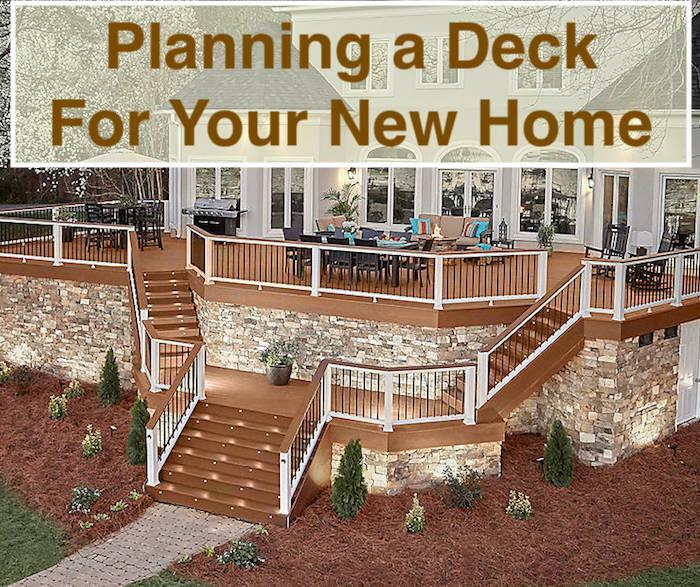 But there are a number of other important considerations when planning a deck. Even the simplest of decks like the one shown above needs detailed planning and a careful design layout (courtesy of Deck and Basement Co.). Should I Do it Myself or Hire a Contractor? Most experts consider building a home deck a “moderate-to-hard” undertaking. From the outset, you have to decide whether you are up to the challenge of the project or want to leave it to the professionals. Keep in mind that a design professional can help with the size, layout, materials, and features of your deck. Once you make the decision between “DIY” and a contractor, you can move on to other important considerations. What types of activities do you plan for your deck? The rule of thumb is to allow these activities – family gatherings and meals, small cocktail parties, barbecues, relaxation, and more – to dictate its size, features, and access point. The deck should be large enough to accommodate all your planned activities. It should also complement your landscape, its natural surroundings and your neighborhood. It’s understandable to want a deck with all the amenities, but don’t make it atypical of your neighborhood. Plan and design a deck that is distinctive and fits your lifestyle – and is appropriate for your area. When deciding on the main access point, through the kitchen is not the most suitable option because it will create traffic through the cooking and prep areas. Make sure railings are away from windows and out-swinging doors. The best design is to install sliding glass doors in the living room, dining room, breakfast nook, or family room that open onto the deck. Just slide the glass doors in the dining room of this 4-bedroom Contemporary style home plan (top) and step into its charming deck (bottom), which is outfitted with accessories and comfortable furniture (House Plan #161-1085). Just as in buying a house, you have to establish a budget for your dream deck to cover all the costs that come with building it. 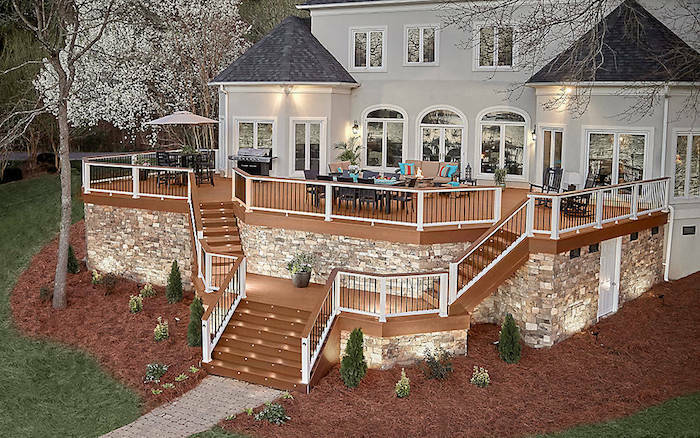 A number of factors determine the total cost of a new deck – height, shape, number of levels, railing length, steps and benches, and built-in features. In addition, there are permit fees, labor and professional fees. The average homeowner usually spends as little as $2,000 to about $7,000 to build a 200-500-square-foot deck. 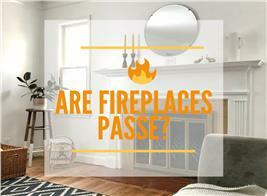 Bigger ones can cost between $14,000 to $20,000 – depending on its size, building materials, and amenities. A simple do-it-yourself project can run as low as $900 to $1,800. Whichever option you choose, be sure you understand all the requirements – and stay within the budget for your deck. 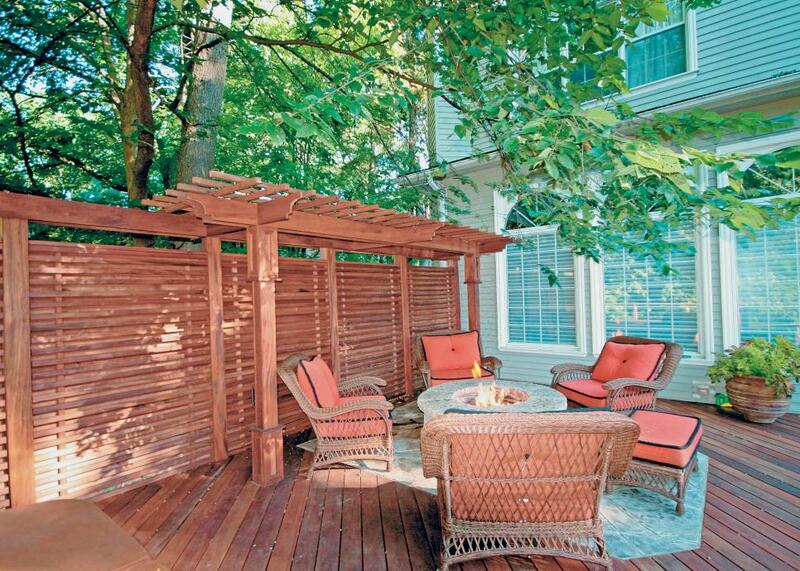 A charming and cozy “do-it-yourself” deck project enhances the backyard of this home. Using 2x6 pressure treated beams for joists – supported by concrete deck piers – and 2x4 Douglas fir wood for deck wood, the homeowner built her own deck for about $900 (courtesy of Home Depot/Alexi Politis). Get Creative – with a Design Layout! To get a better estimate of costs involved in building a deck, experts suggest doing a layout of the deck – and position all the fixtures and furniture in the spaces they are likely to occupy on the deck. Mark the space for a dining table and chairs, couch, deck chairs with cushions, side tables, plants, grill – if you’re planning on using one – at least three feet away from any wall and five feet from any overhanging structures. Walk around to be sure you have enough space to move around from one area to another. Once you’re very clear on the specifics of the deck’s size and layout, you can talk costs, timelines, materials, and special features with a contractor to get the project underway. This very well-laid out deck of a 2-story, 5-bedroom Country style home includes a dining area with tables and chairs and a lounge section – equipped with comfortable chairs and a wrought iron table – ideal for cards and board games – not to mention a great view (House Plan #161-1030). How Will You Outfit It? 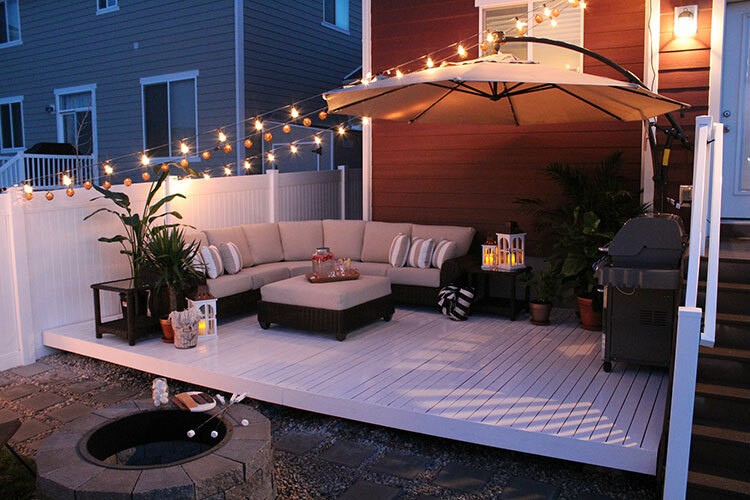 You may want all the amenities of outdoor living on your deck – dining table and chairs, as well as furnishings for a small lounge area, perhaps a grill and fireplace, planters – but remember not to overload it. Most outdoor decks are designed to support 60 pounds per square foot, including the weight of the deck, people, and furniture. Do the math on a 200-square-foot deck and what it can support. 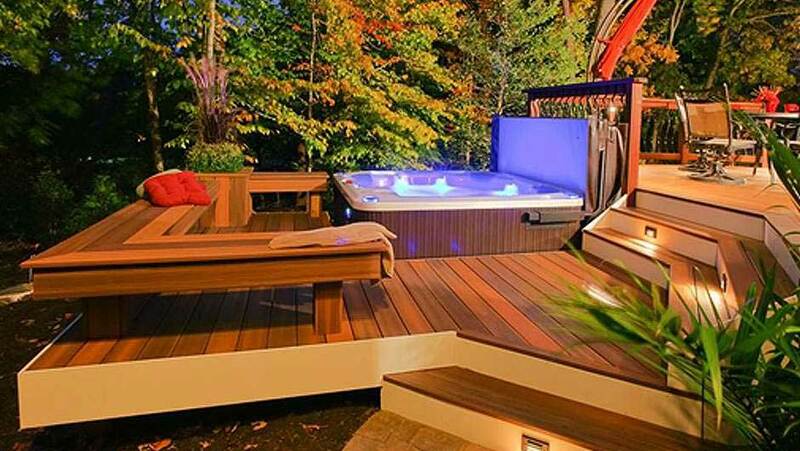 Pass on a hot tub or heavy fixtures if you have not strengthened your deck’s support structure. A 3-bedroom, 3.5-bath Craftsman style home plan (top) includes this deck (bottom), which comes with a fireplace, a lounge area with chairs and a center table, and a dining section complete with dining table and chairs (House Plan #161-1081). 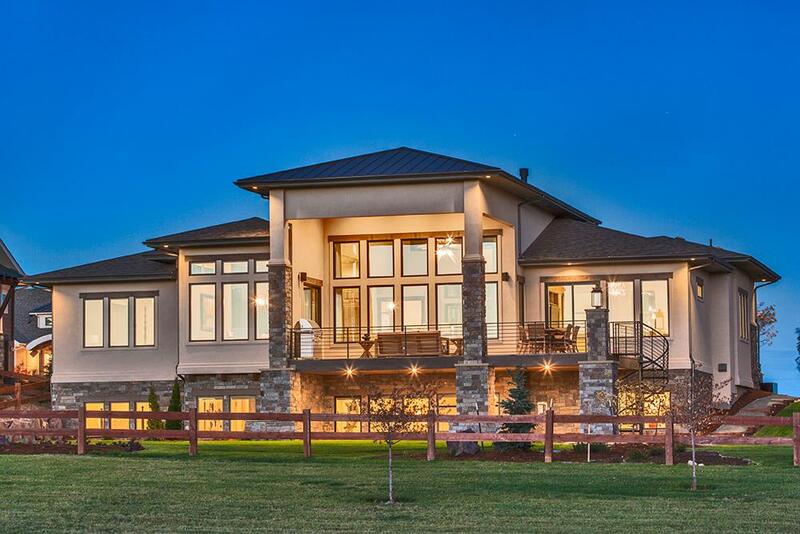 True outdoor living! 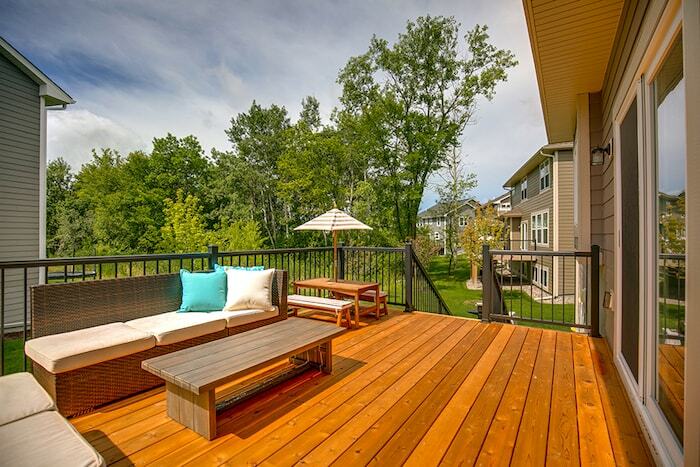 As you go ahead with plans for your deck, ensure that the design deals with common problems. 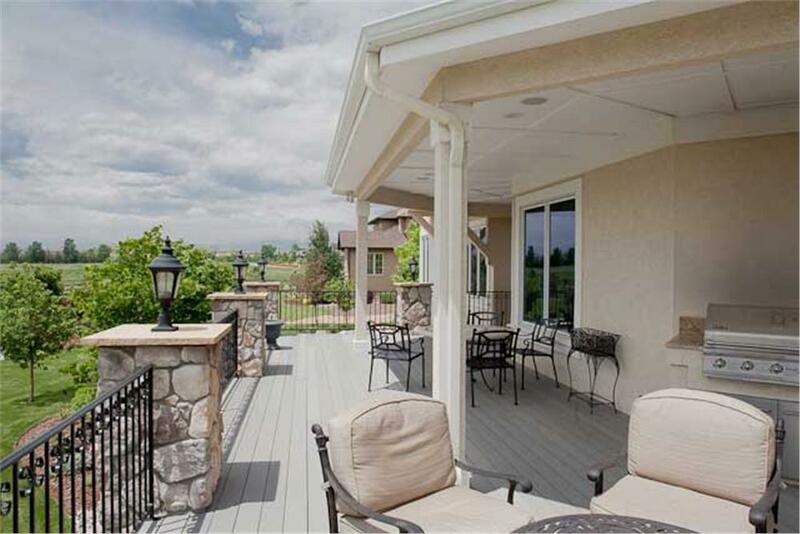 • Sloped Yard – Not all decks are laid out on a flat landscape. Think multi-level for a sloped yard – with the hot tub on the lower level and space for meals and entertaining on the “upper” deck. 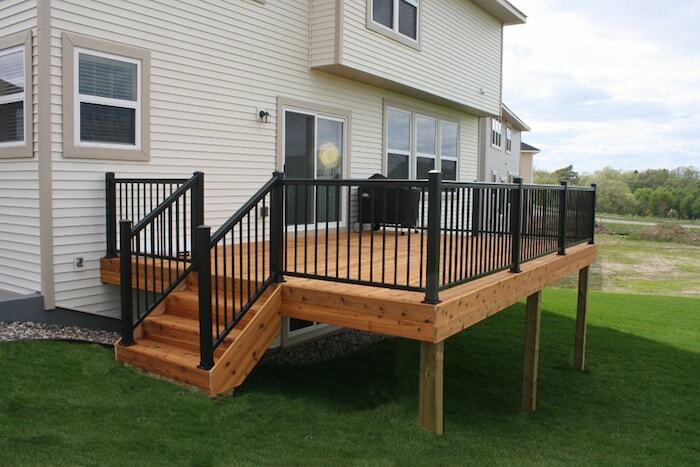 With a two-tier deck, there is no need to use extra-tall posts that require bracing. 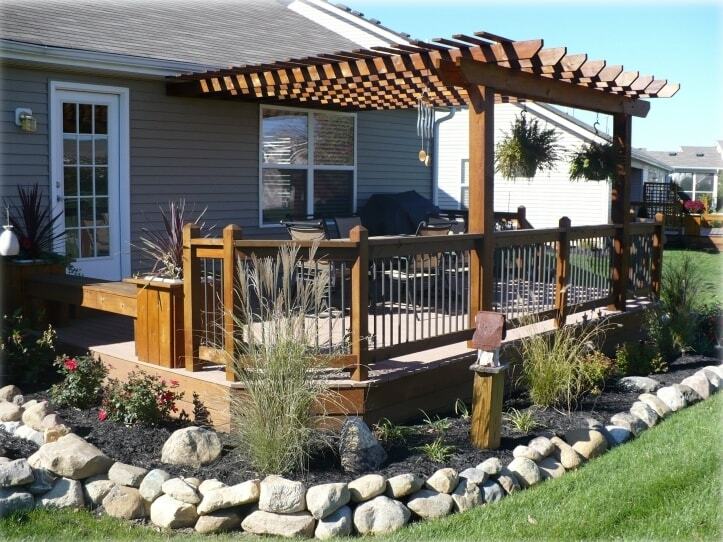 A multi-level deck is the answer to a sloped yard. Check out the hot tub on the first tier and the dining area on the second level (courtesy of Fiberon). • Think of weather conditions – and install a pergola or awning that provides shade from the sun – plus rain and wind if possible. How about a pergola to protect the family from the sun’s rays? This deck gets shade from the house roof and a pergola built over the outside dining area (courtesy of Decks by Design). • Privacy wall/screen - If you live in an area where houses are built close together, you’ll need some kind of wall to create a barrier between your deck and the neighbor’s house or yard. A wooden wall or a screen will give you the desired privacy and “protection” from street noise. A wall high enough to ensure privacy but low enough to have a view of the natural surroundings gives this attractive deck that barrier from the neighbors (courtesy of Hickory Dickory Decks). • Permits and Regulations – Get in touch with state, county, and/or city offices for the necessary permits and building and structural requirements covered by local codes. Homeowners Associations (HOAs) may also have guidelines regarding materials and finishes you are allowed to use. Your contractor can help with local utility companies – or be sure to contact them if you're "do it yourself" – for the location of any underground cables, wires, or pipes. Overall, follow rules and regulations in order to build your deck properly. • Lights – Local codes already mandate lights for stairs to ensure safety during the climb. To improve visibility – and safety – at night and enhance the ambiance, you can install solar LED deck lights on the railings and the deck itself. An amazing deck becomes spectacular with all the lights on the stairs, the rails, and the deck itself (courtesy of Trex). • Stairs and Railings are also governed by local codes. But homeowners can make stairs easier to climb by selecting shallower steps with deeper treads. As far as handrails go, they must be not only code compliant but also durable and easy to grip to prevent people from tripping or falling. Once the planning blocks are set in place, homeowners can jump into the actual construction of their dream decks. Whether it’s a “do-it-yourself” project or one contracted with a professional, it's sure to be one popular and satisfying undertaking.